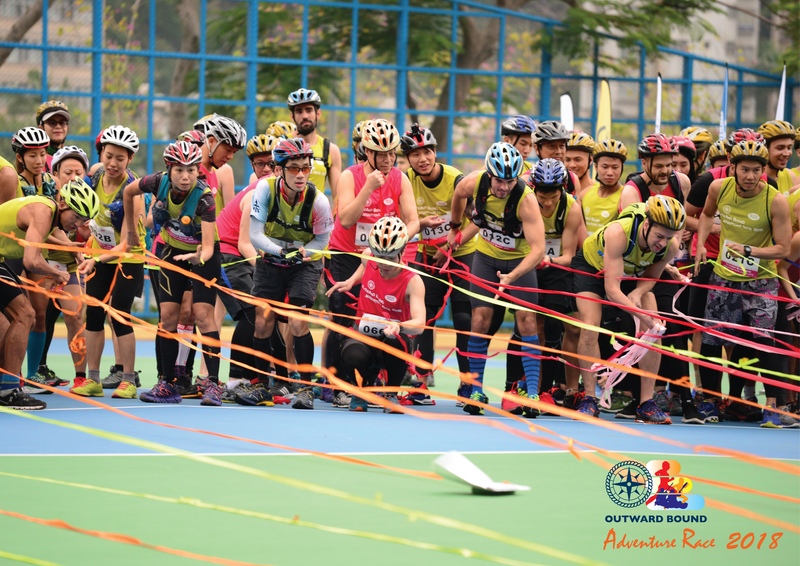 The 2019 Outward Bound Adventure Race was successfully staged yesterday despite the extra challenges added by the unfavourable weather conditions. Thanks to everyone who took part. We hope you had fun and have some collective memories to share among your teammates and friends for years. Because of you, we are able to continue our community works for the disadvantaged youth in Hong Kong. Huge thanks for working with us to make a real big difference in our future generations. One reason we were able to put on the race is the tremendous support by received by our supporting partners, which includes our main sponsors Vitasoy 維他奶, Swire Properties, Taikoo Place, GoPro, Latitude Limited, Fujikon, Protrek 保捷行, Reecho Shop 專業戶外旅遊裝備店, Teva, Kiehl's, Mainfreight, Jelly Belly, 美國太子行-香港 Prince of Peace - HK, Nature's Village 樂健坊, Dole Hong Kong, Blue Girl Beer Hong Kong 藍妹啤酒 , Salonpas, and Seiko. We are also grateful for the help of The Hong Kong Sea School, CORES 健衡物理治療及專項訓練中心 Centre of Rehabilitation & Exercising Specialistand our lovely volunteers and OB staff along the route that enabled you a safe and enjoyable morning. Many thanks to Dickson Lui, Eddy Wong, Jac Cheung, Matthew Leung, Patrick Lam, Raymond Leung and Vincent Wong for capturing the joy and pain of our racers. Last but not least, on behalf of everyone at Outward Bound Hong Kong, thank you for making this event happen. Without your support and willingness to be involved, the event could not be possible. Let's see next year or at the Outward Bound Multi-Race on 29 Sep. Thank you! Outward Bound Adventure Race is unique from other trail running events. The race route is unknown until you see the ribbons and approach the checkpoints. You may find the experience challenging, mysterious yet interesting. This is what the race is all about. Friends don’t let friends not exercise. Why not convey a good wish to your friends, motivate them to get stronger and live healthier from the beginning of Year of Pig. Here’s the chance for you and your friends to win four UV-resistant yet stylish straw hats (a maximum quota of 10). 【Game Rules】 1. "Like" Outward Bound Adventure Race” Facebook (Privacy of Likes should be set as "Public") 2. Tag 3 friends in this post and send them your blessing. E.g. @Alice @Jessica @Kit. Friends that workout together stay together. 3. The 10 most creative message will receive 4 hats each. 【Result Announcement】 Results will be announced here on 18 February. THREE DAYS left to register your team for one of the most anticipated endurance races! Just because it’s cold and cloudy outside doesn’t mean you can put away your sunscreen. Protecting skin against UV damage is a year-round commitment. We are so very lucky for having possibly the best sunblock product sponsored by Kiehl's to help hydrate and protect your skin from UV rays and pollution. 25 January, 2019 - Finisher Towel just for YOU! It doesn't matter whether you come in first, in the middle, or last. As long as you hit the finish line, you will be given a towel to drape over your shoulders by our volunteers for crossing the finish line. Yes, it's for all categories. The towel has an ultra-soft, natural feel that any runners & sun-seekers alike have come to love. Just make sure you sign-up for the race, put yourself on the start line, expose yourself to the unknown and reach the Finish point - Taikoo Place before the cut-off. Early bird offer is due on 31 Jan. Form your team and register now! We are calling the brave and fearless you to take part in the next Outward Bound Adventure Race on 10 Mar 2019 (Sun). The event is designed for teams of fours and two course options are available – Challenge route at 16km or Elite route at 20km. A mixture of trailing running, kayaking, swimming and tactical navigation is expected. It’s an event that every outdoor enthusiast or adventure racing fanatic should not miss. Why not organise your team and click the following link to secure your spot today? Making memories while having fun with friends! Join us at the Outward Bound Adventure Race 2019 with a new endpoint. Details to come. Be on the look out! The Adventure Race 2018 was successfully held on 4 March (Sun). We had so much fun an awesome time and hope you did too. The event was designed for those keen to test their body, mind and physical endurance and we hope you and your friends have plenty of adventure together while raising funds for a worthy cause. Every year the course was different, and this year, the padding session was meant to be tougher and more challenging. We hope you enjoyed the mystery quiz and the memory game along the course too. Every single participant should be proud of their accomplishment, whether you barely made it or ended up on the podium. Congratulations again to Team CORES 健衡物理治療 who came first in the elite category with a time of 3:23:05, and Master Frog Men in the challenge category with a time of 3:02:51. Great job to all. We have already received some amazing pictures of the race which will be uploaded here. Feel free to share! A big thanks to Bely Kwok, Raymond Leung, Dickson Lui and Vincent Wong for their work capturing your joy and pain. One reason we are able to put on the race is the support through our sponsors and the supporting organisations. They include our main sponsors Vitasoy International Holdings Ltd., The Link Asset Management, GoPro, Latitude, Fujikon, Protrek 保捷行, Reecho.hk, ESCAPADE Sports, Jelly Belly, Jelly Belly, NaturSource, Sconza Chocolates HK, Blue Girl Beer Hong Kong 藍妹啤酒, Kiehl's, Gone Running, Salonpas & SEIKO 精工表. We were also grateful for the help of the St John Ambulance, The Hong Kong Sea School, CORES 健衡物理治療及專項訓練中心 Centre of Rehabilitation & Exercising Specialist and our lovely volunteers to enable we run a safe and successful event. Last but not least, on behalf of everyone at Outward Bound Hong Kong, thank you for making this event such a success. Without your support and willingness to do something a little more adventurous, it could never have been the success that it certainly was. We look forward to seeing you next year or at the Outward Bound Multi-Race this Sep/Oct.